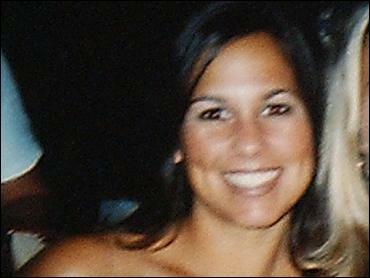 Scott Peterson's defense called a witness to suggest that his pregnant wife's abduction and murder may have been the result of mistaken identity — a crime carried out by perpetrators seeking to attack a woman who looked just like Laci Peterson. Defense lawyer Mark Geragos noted Monday during questioning of Modesto police Detective Craig Grogan that authorities had received a tip early on from a woman whom the lawyer only identified as "Michelle" about the possibility that Laci's killing may have been a mistake. The woman worked as a prosecutor in Merced County and lived near the Petersons' home in Modesto, Geragos said. Describing her as looking very similar to Laci Peterson, Geragos said the woman had given birth to a child in October 2002. And, that she walked her dog — oddly, the same kind the Petersons had with the same name, McKenzie — in the Petersons' neighborhood. The woman had recently been threatened after prosecuting a case. She called police after Laci vanished to report that the alleged abductors "might have mistaken Laci Peterson for her, correct?" Geragos asked the detective. Geragos then added that authorities never thoroughly followed up on the tip. Grogan was due back on the stand Tuesday. It was just one instance Monday where Geragos turned one of the prosecution's key witnesses — the case's lead investigator — in his favor. He pointed out that police did not take seriously many of the reported sightings of Laci on the day she was reported missing — Dec. 24, 2002. Geragos highlighted one tip specifically when a man claimed to have seen Laci that morning. The tip came within a week of her disappearance. "Is it a fair statement that nobody contacted him ... until approximately six weeks ago during this trial?" Geragos asked. "That's correct," Grogan replied. "I can't say that the sightings were automatically a priority for us at that time." Grogan also backed up another key defense theory that the pregnant schoolteacher had planned to walk the couple's dog the morning she vanished. Prosecutors allege Peterson killed Laci on or around Dec. 24, 2002, in their home, then dumped her weighted body into San Francisco Bay. Her remains — and that of her fetus — washed up in April 2003, not far from where Peterson launched his boat that Christmas Eve morning for what he claims was a solo fishing trip. Defense lawyers maintain someone else abducted and killed Laci while she walked the couple's dog in a nearby park. The dog was found by a neighbor in the street the morning Laci vanished, according to previous testimony. Prosecutors claim Laci had stopped walking the dog weeks earlier at her doctor's request, and that Peterson set the dog loose to make it appear as if someone else abducted her. But Grogan acknowledged Monday that Peterson told police on the first night of the investigation that Laci had planned to walk the dog that morning. Sharon Rocha, Laci's mother, told Grogan a few days later that Laci walked the dog every morning, the detective testified.